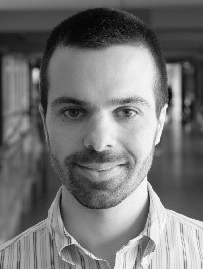 Federico Tadei is Visiting Professor in the Department of Economic History at the University of Barcelona. His research interests focus on the history of long-run economic development of Africa, with a particular emphasis on colonial trade and inequality. 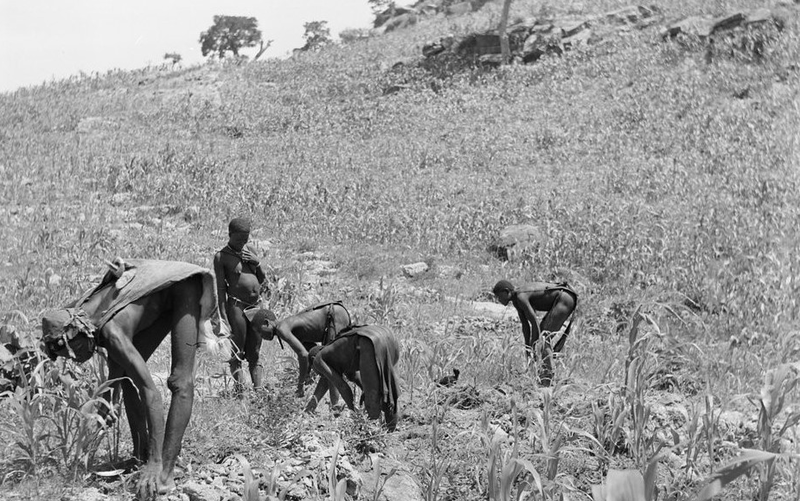 Under French colonial rule, trade monopsonies were often established to reduce prices paid to African agricultural producers below competitive prices and increase the profit margin of the European trading companies (Suret-Canale 1971, Tadei 2019). 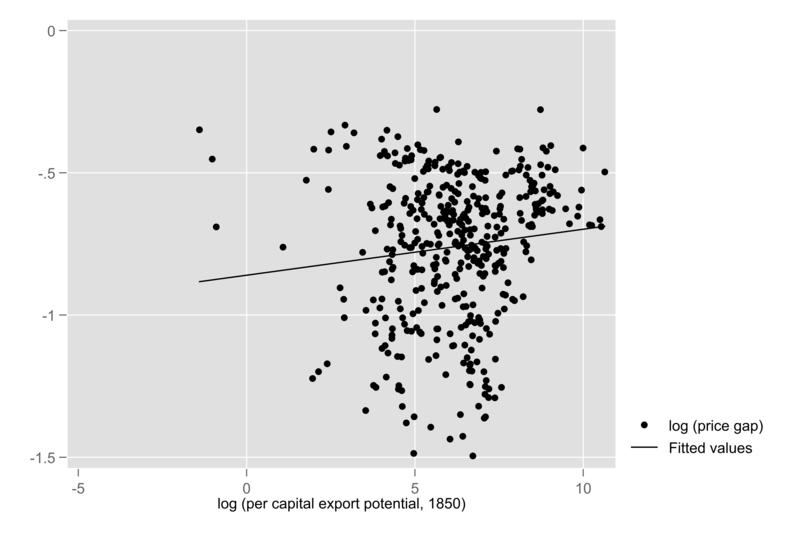 Did those trade policies affect long-term African economic development? There are several reasons why we could expect colonial monopsonies to have a negative effect on subsequent economic growth. First, they were an inefficient way to organize local production and trade, they encouraged rent-seeking behaviors on the part of trading companies and government officials, and they impoverished African farmers, discouraging investments in agriculture. Second, post-colonial governments continued to operate similar monopsonistic institutions (i.e., caisses de stabilisation or marketing boards) until the 1990s. In this paper, I check whether the reduction in African prices due to colonial trade monopsonies can explain current regional differences in economic development in the French colonies. Following Tadei’s (2019) methodology, I construct district-level estimates of the strength of colonial monopsonies by using the gap between prices that the trading companies paid to African farmers and theoretical competitive prices that should have been paid in a competitive market. I compute district-level price gaps for the main exported crops and I combine them with data on soil suitability in order to construct average price gaps at the sub-national level. 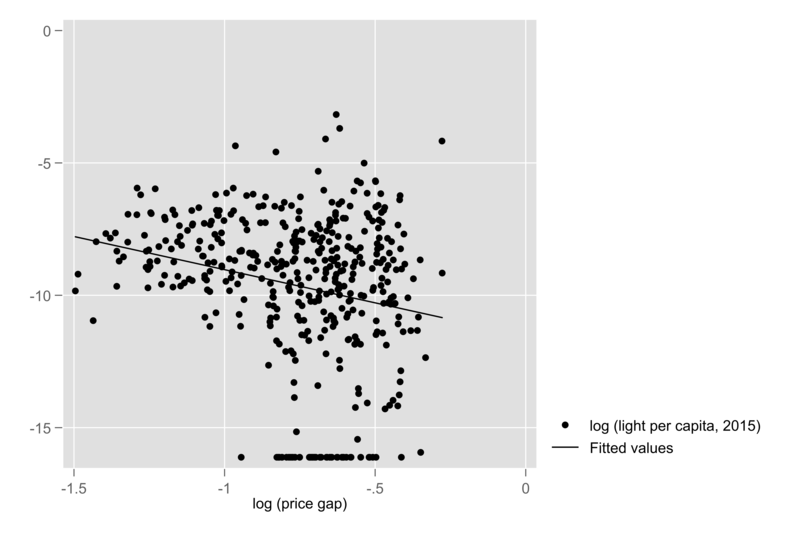 I show that such price gaps are strongly negatively correlated with current development in rural areas (see Figure 1), as proxied by luminosity data from satellite images (Michalopoulos and Papaioannou 2013). The relationship is not driven by observable differences in population density, land endowments, geography, disease environment, resources, or access to markets. Moreover, it cannot be explained by differences in national institutions, as it is robust to the inclusion of country fixed effects: the reduction of prices to Africans during the colonial period accounts for differences in development both across and within countries. Finally, districts that faced higher levels of colonial extraction are characterized today not only by lower levels of development, but also by slower economic growth, as measured by the change in luminosity over time. A robust correlation however is insufficient to establish a causal link between colonial trade monopsonies and subsequent growth. Despite controlling for a large number of factors, the correlation between price gaps and development might still depend on the fact that the colonizers could have imposed lower prices on initially poorer areas. To address this concern I use two strategies. First, I perform a placebo test by computing “theoretical” price gaps for urban districts, i.e. price gaps that these districts would have faced had they produced any crop. I show that, among urban districts, price gaps are not correlated with current development. Second, I demonstrate that it was the potentially richest areas, not the poorest ones, that faced higher levels of colonial extraction. In fact, we observe larger reduction in producer prices in the districts that had greater potential for export crops (see Figure 2). The estimates suggest that, for a district with median luminosity, a one-standard deviation increase in the strength of monopsonies (price gaps) is associated with a 10% reduction in economic development (luminosity). In addition, given the selection of initially richer areas into colonial extraction, the actual size of the effect is likely to be even larger. The magnitude of these results is puzzling and raises the following question: if these policies were so detrimental for economic development, why did post-colonial governments maintain them? To answer this question, I explore Bates’ (1981) hypothesis that trade monopsonies, despite hindering overall development, were actually beneficial to the urban-industrial sectors of African societies. Suggestive evidence presented in the paper shows indeed that colonies that experienced stronger monopsonies have now more developed cities and a higher level of inequality between urban and rural areas. The economic benefits that urban-industrial sectors obtained may be the reason why trade monopsonies and extractive institutions persisted for a long time after independence. Bates, R. (1981). Markets and States in Tropical Africa: The Political Basis of Agricultural Policies, Los Angeles: University of California Press. Michalopoulos, S. and E. Papaioannou (2013). Pre-Colonial Ethnic institutions and Contemporary African Development, Econometrica 81(1): 113-152. Suret-Canale, J. (1971). French Colonialism in Tropical Africa, 1900-1945, New York: Pica Press. Tadei, F. (2018). 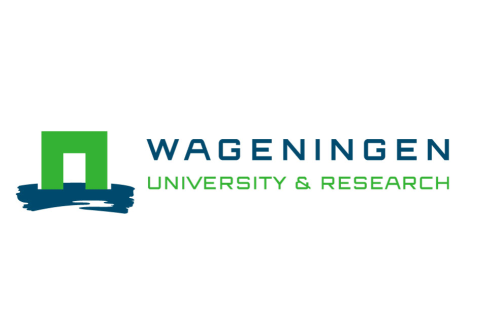 The Long-Term Effects of Extractive Institutions: Evidence from Trade Policies in Colonial French Africa, Economic History of Developing Regions, 33:3, 183-208. Tadei, F. (2019). Measuring Extractive Institutions: Colonial Trade and Price Gaps in French Africa, European Review of Economic History, forthcoming. Featured image: Joudiou, Philippe (1950). Pays Matakam, Culture du Mil. Bibliothèque Nationale de France, Département Cartes et Plans, GE EE-8790 (CA-071). http://catalogue.bnf.fr/ark:/12148/cb453735963.